That’s right! I was floored that my publishers are doing a 20-day 100 book giveaway on Goodreads. What a great way to kick off the summer! It’s part of their “Read a Series” promotion and, let’s face it, who doesn’t want to melt into a wonderful series during the lazy days of summer? Of course, I’ll be writing a series rather than reading them…most likely. 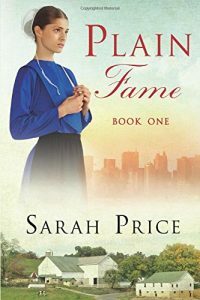 The Plain Fame series begins with the first book, Plain Fame. Readers will meet Amanda Beiler, a young Amish woman who accidentally meets Alejandro Diaz, a Cuban rock star known as Viper. While she is not familiar with him, his fame, or his reputation as a womanizer, Amanda soon becomes entrenched in the hearts of social media who fall in love with her. Unfortunately, her community becomes inundated with paparazzi and she has a choice to make. That one decision will impact her future and change everything for Alejandro. A nice clean and wholesome series to read, whether you are lounging on the dock, sitting by the pool, or enjoying the ocean. ⟵Celebrate An Amish Buggy Ride With Me! You certainly outdid yourself in this last book and of course all of them. I’ve read the series many times over and anxious to see what else you have coming our way soon. I feel like these characters are real people and think about them often. Guess I have to realize they aren’t! But thanks for publishing more than just the 3 you planned.